If you haven't read Through Many Fires now is the time to get it. As an indie writer I have to do test marketing. Recently I’ve been testing BookBlast, an email newsletter of free and bargain Kindle books, as part of my advertising. Today they sent out the pictured promotion. As stated, Through Many Fires will be available for 99 cents from today, February 17th through the 21st. In Through Many Fires, terrorists smuggle a nuclear bomb into Washington D.C. and detonate it during the State of the Union Address. Army veteran and congressional staffer Caden Westmore is in nearby Bethesda and watches as a mushroom cloud grows over the capital. The next day, as he drives away from the still burning city, he learns that another city has been destroyed and then another. After February 17th Through Many Fires will returned to the regular $2.99 price and I don’t anticipate it being discounted again until the next book in the series, A Time to Endure, comes out later this year. I wanted to start the new year off right and so I arranged to do some promotions. Readers of my newsletter learned earlier this month about Smashwords discount coupons for my novels. However, that is not the only promotion I am doing this month. This week, I did another campaign featuring my science fiction novel, Titan Encounter. For those of you who aren’t familiar with it, Titan Encounter is a science fiction space adventure. I hesitate to make comparisons, but for the purpose of clarity I’ll say Titan Encounter is somewhat like Battlestar Galactica in the way it mixes science fiction and religion, but Titan is Christian friendly. 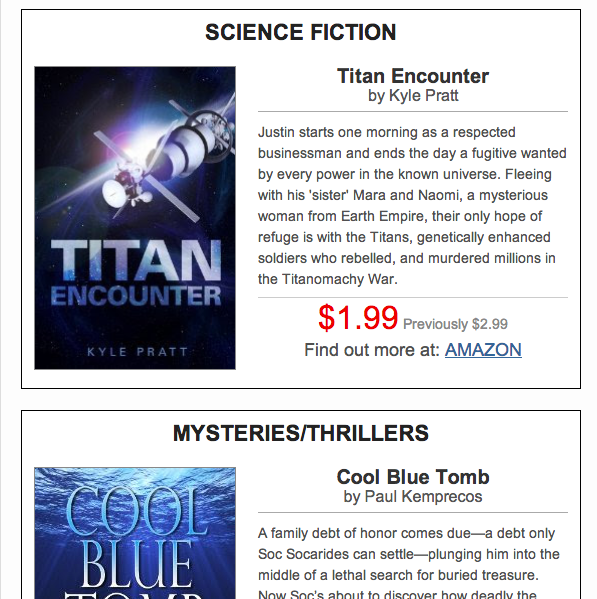 Titan Encounter was featured yesterday on the BookBlast mailing of Free and Bargain Kindle Books. This promotion raised Titan Encounter to the number six spot on the on the Amazon Kindle Christian Futuristic bestseller list. If you haven’t read Titan Encounter, it will be selling at the promotion price of $1.99 through January 17th.